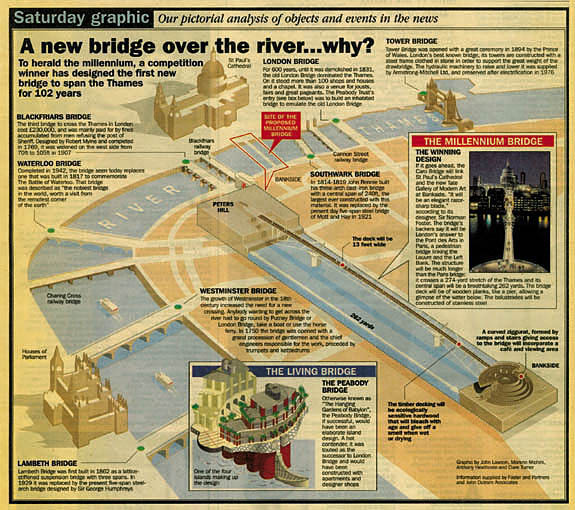 A CUTTING FROM THE SUNDAY GRAPHIC OF 1996 SHOWING THE TWO ALTERNATIVE KINDS OF BRIDGE PROJECT: THE FOOTBRIDGE AND THE INHABITED, OR 'LIVING' BRIDGE. Ours was the entry from the Peabody "Inhabited Bridge" Competition that seemed to catch the public imagination. It was frequently compared to the 'Old London Bridge'. There had been, before the Competition, an exhibition in the Centre Pompidou, in Paris, curated by my friend Jean Dethier. There was , after it an Exhibition in the Royal Academy, London. None of them, so far as I know, led to any real projects. I warmed to the idea of a 'land bridge' that would be inhabited, although one did not know by quite what. It seemed a sensible restoration of the 'Street' as the key instrument of urban planning - something that the Minimalists and High-Tech Architects, and all 20C hardliners generally might say they promoted, but really hated. Body-language gives everyting away and the hardliners never cease from hating 'facade -architecture' and loving free-standing skyscrapers and other uncivil acts. Having said this one still needed to retain the quality of a bridge, which is to be open and dangerous and over water.